They say that virtue is its own reward, but sometimes you get an added bonus thrown in. It was necessary for a 500m long title boundary at Glenwood to follow an existing fence, and we had previously surveyed the two ends of the fence. Between the two ends the fence descended steeply into two gullies of the kind of dense bush in which you wouldn’t be all that surprised to find some lost civilisation or at the very least a Moa or two. I had become concerned that there might be a slight bend in the fence and it was important we didn’t end up inadvertently gifting our client a few hundred square metres of the neighbour’s place. I decided that the best course of action would be to borrow my wife’s machete and pop over to Akaroa on a sunny Sunday to walk the length of the fence. Descending into the first gully I became gradually aware of the noise of rushing water. 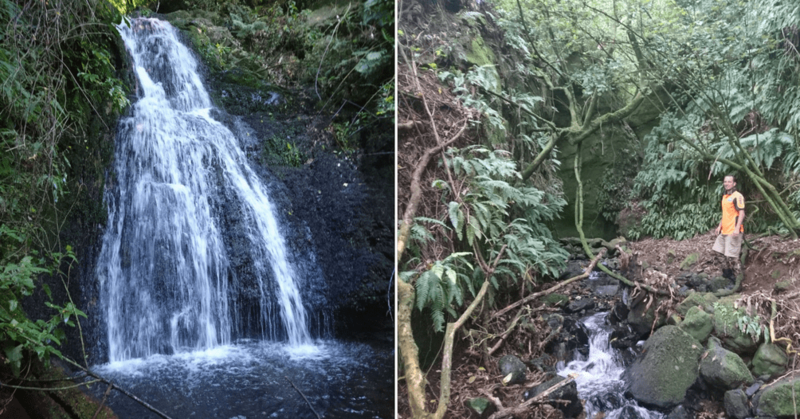 Picking my way carefully into the streambed and working my way upstream through a tangle of creepers and deadly ongaonga, I rounded a corner and was presented with the site of a charming little 5-7m high waterfall. I celebrated my find with a cup of tea before continuing along the fence. The presence of this hidden gem came as welcome news to the landowner who was unaware of its existence, particularly as, it fell within the area of protected bush to be retained after creation of two new lifestyle blocks. There was indeed an angle in the fence, and we pegged this on a return trip. While we were there Morgan and I investigated ‘The Grotto’, a better known and more spectacular waterfall downstream of my earlier find. Carved on the sandstone walls are initials and dates of previous visitors going back to 1896, apparently including legendary Antarctic navigator Frank Worsley, who was a local lad. Following the dictum of taking only photos and leaving only footprints, Morgan and I didn’t add our initials to the walls, but contented ourselves with quiet contemplation and a few entries for the monthly photo competition. Experiences like this are part of what makes surveying the unique and rewarding profession it is.